Ovenfor har samlet nogle fede items, der man mixes og matches på forskellige måder, men som alle sikre dig et cool, festligt outfit uden at du behøver hoppe i et skørt. Klik på de items du bedst kan lide, for at komme direkte til den online shop hvor de kan købes. HUSK OGSÅ AT DU I DAG HAR MULIGHED FOR AT VINDE LUKSUS HÅRPRODUKTER TIL EN VÆRDI AF 1145 KRONER HER PÅ MIN BLOG! KLIK HER FOR AT KOMME DIREKTE TIL KONKURRENCEN. English: December and the cold temperatures are not the perfect match for short dresses and bare legs, but at the same time there is hardly any more festive outfit than a dress? Are you one of those who would like to dress up for Christmas Eve, but don't want to wear a dress. This post is for you. 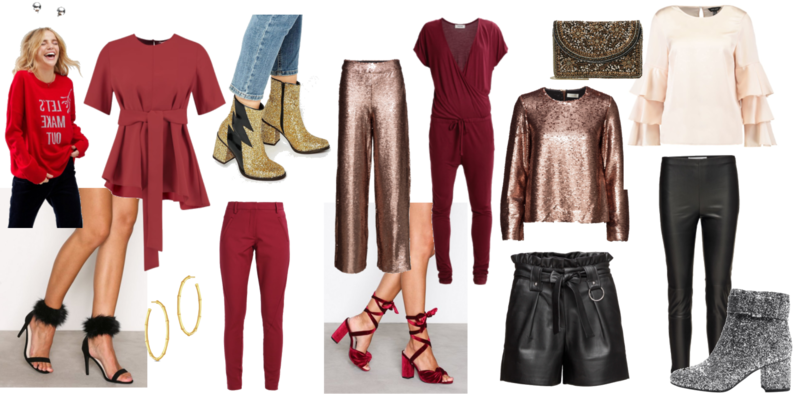 Above I have collected some cool items that are possible to mixed and matched in different ways, but all of them ensure you a cool, festive outfit without a skirt. Click on the items you like best to get directly to the online shop where they can be purchased.